I read this in French on the bus to the Pentagon metro station every morning during the winter of 1984!!! Simple, good writing, good criticizing well efficient. I had to read this for college, in our Works in Translation unit. 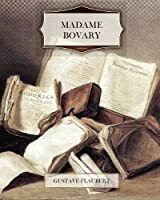 I wasn't a big fan of it, because Emma Bovary is kind of skanky, but I like how the novel criticises the aristocracy of the time and expresses the dangers of fantasy. I wouldn't read it again though, even though it grew on me exponentially.